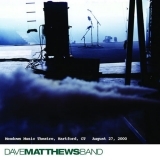 The Central Park Concert (2003), Live At Red Rocks 8.15.95 (1997), Under The Table And Dreaming (1994), Remember Two Things (1993), Live At Folsom Field, Boulder, Colorado (2002), Live At Piedmont Park (2007), Live At Mile High Music Festival (2008), Live Trax Vol. 3: Hartford, CT August 27, 2000 (this album) (2005), Live Trax Vol. 4: Richmond, VA April 30, 1996 (2005), Live Trax Vol. 7: Hampton, VA December 31, 1996 (2006).